At Spring Quilt Market in Minneapolis, MN, I luckily happened across Marsha McCloskey's booth. 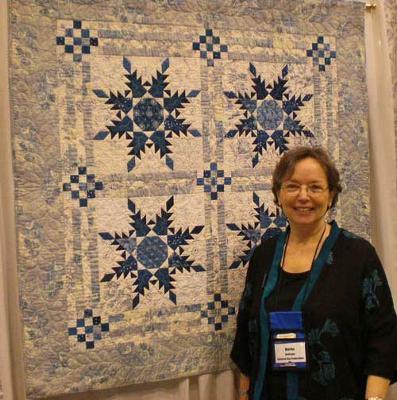 The quilt block in "Radiant Blue" is found in Marsha's book, "Feathered Star Quilt * Blocks * I". It is the "Radiant Star" pattern that begins on page 22. If you are into making feathered star quilts or you are interested in drafting your own quilt blocks, this is an exceptional book to have. Now I do have to warn you...the book states quite clearly on the cover that it contains "...Really hard blocks that take a long time to make". And she's not pulling your leg. But if you're ready to make more complicated quilts, Marsha has done a wonderful job with this one explaining both how to draft and how to piece the feathered star quilt blocks. Beautiful, inspiring work, Marsha! I can't wait to see what you do next. If you've enjoyed this Quilt, let us tempt you with these other Feathered Star Beauties! Marsha McCloskey's Quick Classic Quilts is the very first quilting book I bought when I started quilting almost 19 years ago. I was teaching in the remote north, and a number of us started a quilt club to teach ourselves how to quilt. I can't remember how many quilts I've made, but it's a family tradition now to make quilts as wedding gifts for anyone in the family getting married and for new babies. I have many quilting books now, but Marsha's is still one of my favourites, and I am now making a scrappy Storm at Sea from her book. It's the sixth quilt I've made from this book. Not only are the stars beautiful, the sashing and cornerstones are also striking. I think I can see feathers quilted into the border as well. Great quilt.